Several possible modifications to Einstein’s theory have been proposed & may even have some experimental support; in addition to string theory & loop quantum gravity, is gravity a thermodynamic effect? Astronomers are looking hard at gravity waves in search of clues as to the origin of the universe (or even as to whether the universe had an origin), and …! I’ve just finished the talk — main problem, too many interesting possible side channels — and have uploaded it as pdf, keynote, power point, & html. Comments welcome! This talk — scheduled for the Library of Congress & for Capclave next week — is now up. It was a lot of fun to put together: I discuss time in relativity & quantum mechanics, kinds of time, some possible time machines, the three kinds of paradox (grandfather, bootstrap, & freewill), the Hawking & Novikov consistency conditions for avoiding paradox, some ways to implement those conditions, paradox noise, what the world might look like if paradox avoiding time travel were possible, and of course why this is likely. I’ve got the talk on line as Keynote (for Mac users), PowerPoint (for PC users), PDF in slides-only and also annotated forms. I’m doing a practice run on the talk in two days at the Radnor Memorial Library in the Winsor room from 6pm to 8pm (when we have to be out). I start the actual talk about 6:30pm. This is a dry run (well more of a wet run really) for the talks next week. If you are not too far from Wayne, PA & have an interest in time & paradox (but then if not why are you reading these words?) please feel free to come! Spoke at noon yesterday (July 10th, 2010) at the Chestnut Hill Book Festival; in spite of heavy rain a nice crowd. 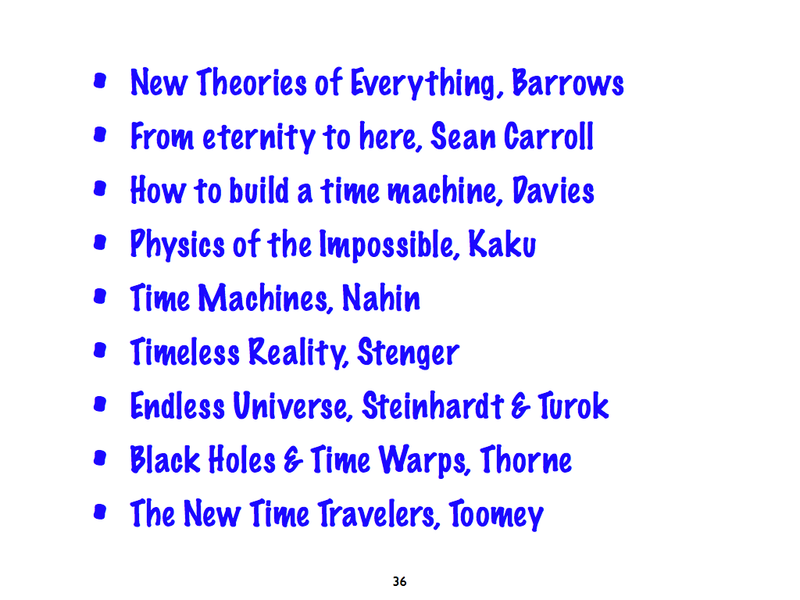 This was my Balticon Time & Quantum Mechanics talk, adjusted for a general (rather than a science fictional) audience. I covered over a hundred years of physics in less than an hour — a lot — but the audience survived & even seemed to prosper, asking some good questions! I’ve uploaded the power point and keynote versions of the talk so you can see the animations of the double slit experiment, if you have power point and/or keynote. You may have to tell your browser how to handle .ppt and/or .key files, for all parts to work with maximum smoothness. I’ve also uploaded the pdf and html versions. The references — several asked after them — are on slide 36. Enjoy! I’d like to thank Oz Fontecchio for organizing this, Ferne Welch for moral & practical support, Bob Rossberg (sp?) for critical help on the AV, & the Chestnut Hill Book Festival for providing the venue! One of the members of my Macintosh programming SIG asked me if for today’s meeting I would talk about Quantum Time, which I was, of course, happy to do. There is nothing like explaining something to a bunch of intelligent listeners for getting it straight in your own head. And if you can get across some of the wonder & the weird that is modern physics, that’s even better! Is time treated using the same quantum rules as space is? can quantum mechanics be written in a way which is manifestly covariant? Introduction, Quantum Time, Theories of Time, Wavelets | John Ashmead | December 8, 2009 11:00 pm | Comments Off on Why quantum time? In relativity time and space are treated symmetrically but in quantum mechanics the treatment of time is very different: in quantum mechanics time enters as a parameter, not an observable. In my dissertation, I bridge this gap from the quantum mechanics side by quantizing time using the same rules as for space and then seeing what happens.